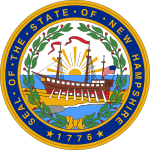 The 1980 United States Senate election in New Hampshire was held on November 2, 1980. Incumbent Democratic U.S. Senator John Durkin was defeated by attorney Warren Rudman in a relatively close election, where nationwide Republicans would have a landslide election known as the Reagan Revolution.